Having first moved from his home at Louveciennes to Montfoucault in Brittany in front of the Prussian advance during the Franco-Prussian War, Pissarro finally fled to England with his family in December 1870. He remained in London, where Monet was also staying, until June 1871. The family first stayed at Lower Norwood and then settled at Upper Norwood: Pissarro had three sets of relations in this area. This painting was for a long time known as Penge Station, Upper Norwood until it was correctly identified as showing Lordship Lane Station. 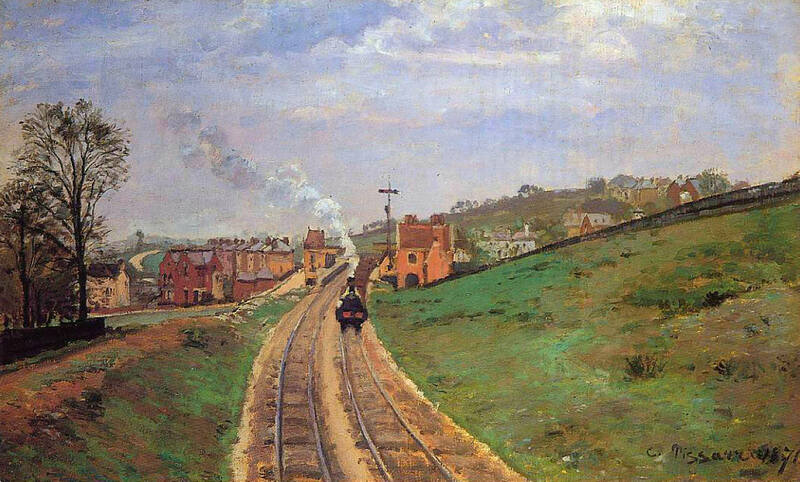 The station, since demolished, was on the Crystal Palace High Level Railway, opened in 1865, and Pissarro painted this view from a footbridge. The line terminated at Crystal Palace High Level Station, near to which the Crystal Palace of the 1851 Great Exhibition had been rebuilt (1852-4), and Pissarro painted several views of the palace and surrounding area during his stay in London. The Palace provided a focus and boost to the local community, and new rows of houses are visible in the left of the work. Instead of the road or pathway that dominates many of his paintings, Pissarro here made the railway and train the central feature, and this was the first Impressionist painting to do so. The entire work shows Pissarro determinedly concentrating on a modern, rather drab theme: either side of the track are featureless expanses of scrubland beneath a grey, overcast sky. It portrays a typical development in contemporary society: the track cuts through the landscape, so triggering the growth of suburbs along its path. Because of the common theme and focus, this picture has often been compared with Turner's famous, Rain, Steam and Speed: The Great Western Railway, which Pissarro would have seen in London. However, where Turner used dramatic, swirling colors and a dynamic composition, Pissarro rendered the scene in an entirely matter-of-fact manner: here it is ordinary and everyday, rather than mysterious and new.